Underage drinking is a national concern that's leading to more injuries and deaths than people realize. In fact, nearly 11 million underage people consume alcohol in the United States alone. These decisions can lead to extremely tragic and devastating consequences. Our law firm has seen first hand the pain that underage drinking causes victims and their families. 4,300 deaths annually are caused by underage drinking. People aged 12 to 20 years old drink 11% of all alcohol consumed in U.S.
More than 90% of alcohol consumed is considered as binge drinking. In 2010, there were 189,000 emergency room visits for injuries related to underage drinking. 1 in 6 teens binge drink (excessively consuming alcohol in a short time period). Only 1 in 100 parents believe his or her child binge drinks. Youth drinking is correlated to adult drinking – children of parents who binge drink are 2x as likely to binge drink. 70% of young people have engaged in heavy drinking by ages 19 or 20. Nearly 75% of 12th grade students, more than 66% of 10th grade students, and about 40% of 8th grade students have consumed alcohol in their lifetimes. From ages 13 to 21, the percentage of people who report binge drinking increases from 1% to 50%. Male drivers are roughly twice as likely as female drivers to have BACs of .08 or higher. Unrestrained drivers 16 to 20 are over 3x as likely to be alcohol impaired than drivers of that age range who use seatbelts. 18 percent participated in binge drinking. 8 percent drove after drinking. 20 percent rode with an intoxicated driver. These numbers are startling, especially when you consider that teen car accidents are the number one cause of death for teens in the United States. Family and friends continue to be a leading source of alcohol for today’s youth. 57 percent of current underage drinkers reported family and friends as their source for the alcohol they consumed. 85 percent of 12th graders, 71 percent of 10th graders, and 53 percent of 8th graders say it would be “fairly easy” or “very easy” for them to get alcohol. Disapproval of binge drinking continues to remain high among all three grade levels (85 percent of 8th graders; 81 percent of 10th graders; and 74 percent of 12th graders). When asked how easy it would be to get alcohol, most 8th, 10th, and 12th graders said "fairly easy" or "very easy." 11% of 8th graders reported drinking during the past 30 days, 3.6% to intoxication. 28% of 10th graders reported drinking during the past 30 days, 14.5% to intoxication. 42% of 12th graders reported drinking during the past 30 days, 28.1% to intoxication. 35% received it from an unrelated person over the age of 21. 53% received it from family and friends. For past statistics, visit our Past Underage Drinking statistics page. Underage drinking affects millions of families every year. That's why it's important to discuss the dangers of teen drinking, peer pressure, and driving or riding with an intoxicated person. If a drunk driver ever injures you or a loved one, contact our law firm for a free case review. We'll answer your legal questions and get you the help you need. Remember, it's free to call and there's never an obligation to hire our law firm once you call. 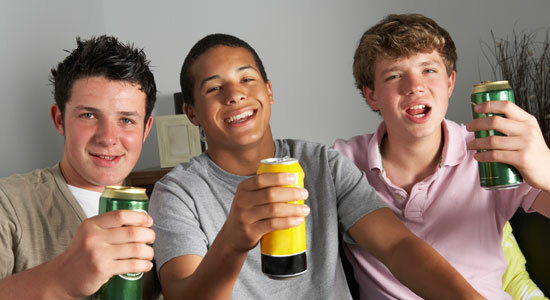 "Fact Sheets - Underage Drinking" Centers for Disease Control and Prevention. "Underage Drinking Statistics" Foundation for Advancing Alcohol Responsibility.